By Sean Jones: IBF light welterweight champion Artur Beterbiev (13-0, 13 KOs) and his promoter with Groupe Yvon Michel have reportedly ended their legal battle, and Beterbiev will now be exclusively fighting for Top Rank Boxing on ESPN in his future fights starting with his May 4 title defense against #14 WBC Radivoje Kalajdzic (24-1, 17 KOs). Beterbiev and GYM have been locked in a legal battle for a while now, and it’s finally over. With his promotional problems, Beterbiev hasn’t been busy as much as he should have been in the last couple of years, in fighting only once in 2017 and 2018. 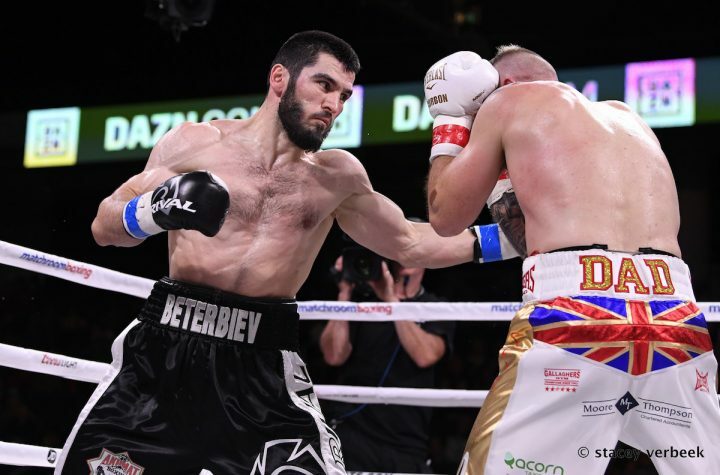 The good news is Beterbiev, 34, will be fighting in two months from now in defending hsi International Boxing Federation 175 lb title against the tough as nails Radivoje Kalajdzic, 27, on May 4 in a Top Rank card in Stockton, California. On the undercard of Beterbiev vs. Kalajdzic is IBF super flyweight champion Jerwin Ancajas facing challenger Ryuichi Funai. It’s unclear if Top Rank will be able to turn Beterbiev into a star or not with the amount of time he has left in his career. The two-time Russian Olympian Beterbiev got a late start on his pro career after turning pro six years ago at a ripe age of 28. That’s young for top fighters, but it’s old for someone just turning pro. When you’ve got fighters turning pro in their teens, it’s kind quite unusual to have someone pushing 30 turning pro. For Top Rank to make the most of the time that Beterbiev has left in his prime years, they’ve got to put him in with the best opposition possible. Kalajdzic is an excellent first fight to get Beterbiev off and running with Top Rank Boxing on ESPN. The promotional company needs to continue putting Beterbiev in with good fighters by matching him in unification fights against WBC 175 lb champion Oleksander Gvozdyk, WBO champion Sergey Kovalev, both of which are promoted by Top Rank, and then WBA champion Dmitry Bivol. It’s unclear whether Top Rank will look to ever match Beterbiev against Bivol. That’s a fight that might be a bad idea for Beterbiev to take unless it’s made right now while he’s still in his prime. The longer that fight waits the more likely Bivol easily wins it. Beterbiev is coming off of a competitive 4th round knockout win over Callum Johnson last October. Beterbiev was badly hurt in that fight by Johnson at one point. Beterbiev will need to fight a lot better than that if he wants to beat Kalajdzic, and unify against Bivol, Gvozdyk, and Kovalev. Kalajdzic almost beat Marcus Browne three years ago in losing a controversial 8 round split decision in a fight that many boxing fan felt that he deserved the victory. If Kalajdzic fights like that against Beterbiev, he could beat him, especially if he comes on strong in the second half of the fight. Beterbiev is a guy with a lot of power, but a low work rate. Kalajdzic has a lot of power, and a high work rate. If you do the match, Kalajdzic could be on the verge of unseating Beterbiev as the IBF champion. If that happens, then Top Rank will have to figure out what they want to do with Beterbiev. Do they take a chance of putting him back in with Kalajdzic and watching him possibly lose a second fight or do they aim him at Kovalev or Gvozdyk? Kovalev is arguably more beatable right now than Gvozdyk. The decision to have Beterbiev defend against Kalajdzic on May 4 means the fight is going to compete with the DAZN fight between WBA/WBC middleweight champion Saul Canelo Alvarez and IBF champion Daniel Jacobs. That’s going to be tough for Beterbiev-Kalajdzic to out-perform that Canelo vs. Jacobs fight, as there’s a tremendous amount of interest from the casual boxing fans already in that fight. If the fans have a choice for which of the two fights they want to see, it’s hard to imagine that they would go in another direction towards a fight with Beterbiev vs. Kalajdzic over the Canelo vs. Jacobs fight. However, Canelo-Jacobs is on on the subscription service DAZN, which goes for $10 per month. It’s possible that the fans will opt to go for the less costly fight between Beterbiev and Kalajdzic. If Top Rank intentionally put the Beterbiev-Kalajdzic fight against Canelo vs. Jacobs, you have to question what they were thinking of. Beterbiev isn’t a big name with the casual boxing fan in the U.S, so it’s a pity that a lot of the people will be tuning in to watch the much bigger fight between Canelo and Jacobs on May 4 instead of Beterbiev’s match against Kalajdzic.